It is a real pleasure to come to the Wellington College. I am very pleased to be here with Lord Strathclyde, one of Wellington’s most distinguished alumnus. Also I am delighted to support your Headmaster, Dr. Seldon. 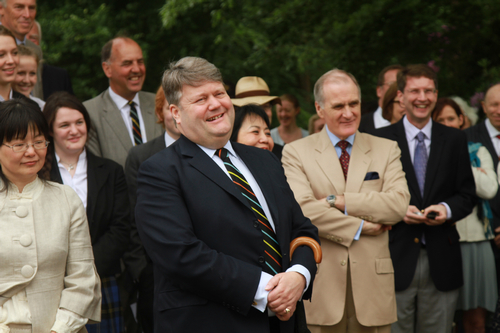 I particularly appreciate his long and pioneering leadership in British education concerning the study of China. Wellington College is a school of 150 years old. Your beautiful campus is like a wonderland. It reminds me of the Hogwarts School in Harry Potter. Only that I see none of you bringing out a magic wand! I am told about a big difference between Wellington and Hogwarts. In Hogwarts, you never see a parent. They see their kids off at platform nine and three quarters at King’s Cross station in London. But here in Wellington, parents are always welcome. Maybe this is why you and your parents have chosen Wellington, instead of Hogwarts. Wellington is a familiar name to Chinese people. The famous Duke of Wellington commanded a war that changed the course of European history. The college after his name is also well-known in China. This is because your first overseas branch is in China—Wellington College International Tianjin. I also heard that last month, you and Wellington Tianjin jointly celebrated the 150th anniversary of Wellington College at the Royal Albert Hall. Today we are here to celebrate another important advance for Wellington School. · Chinese is a language used by a largest population in the world. · China is one of the world’s fastest growing countries. Now it is already the second largest economy in the world. · China has a history of 5,000 years and a rich culture. China has the longest continuous civilisation in the world. 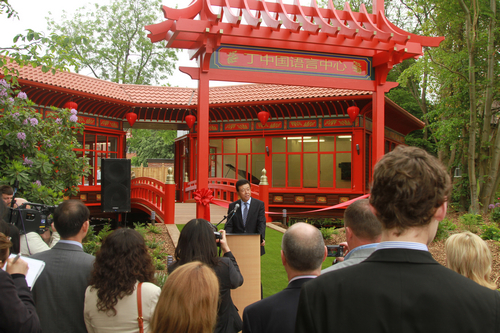 The launch of the Chinese Language Centre here is a British first in middle schools. I hope it will serve as a multi-functional platform. I believe it has a big role to play in three ways. First, the Chinese Language Centre should, above all, be a centre for excellence in learning Mandarin. In this aspect, you already have a role model. A young Briton from Wellington College, Harry Randall, is already a high achiever. In the ‘Chinese Bridge Competition’ for Middle School Students, he won ‘Best Presentation Award’. I do hope to see more outstanding entrants from Wellington College in future competitions. I also wish you all the best in the GCSE Chinese tests. Second, the Chinese Language Centre should be a window through which you learn more about China. Learning a language is a process of learning about a country. I hope through learning Mandarin, you will better understand the richness and depth of the time-honoured Chinese culture, and rapid changes in dynamic modern China. You will also learn more about the warm-hearted Chinese people, who work hard and defy difficulties. 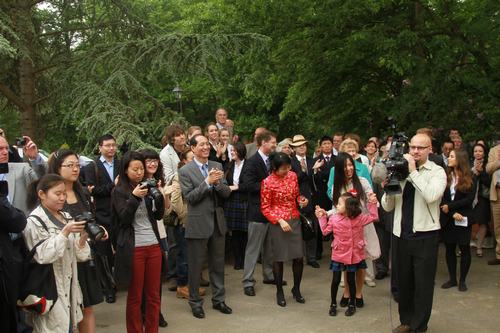 Third, the Chinese Language Centre should build bridges of friendship between British and Chinese young people. Building links between the young people of China and the UK is of fundamental importance. This is the key to future strong and deep understanding between our two nations. So, I am very happy to learn that 11 students from here are now studying and living in your Tianjin school. Another six of you will join them in Tianjin next month. Through such exchange, young Britons will have opportunities to personally experience China while learning Chinese language. They will also be able to spend much time together with young Chinese. This will greatly increase mutual understanding and build many friendships between our young people. I do hope the Chinese Language Centre will lead to more frequent and closer exchanges between young Chinese and Britons. I wish all the students greater progress in learning Mandarin! 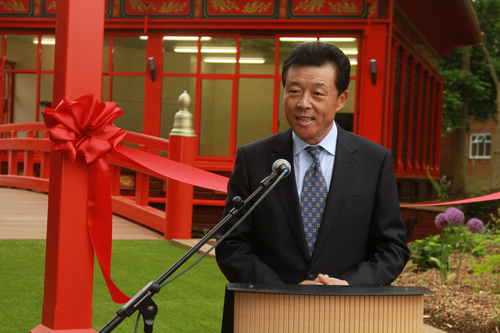 I also wish the Chinese Language Centre of Wellington College a great success! Before I conclude, I cannot resist returning to my thoughts about magic and Hogwarts. Well if you do have magic wands my advice is leave them behind when you visit China! You will find for yourselves that wherever you go in China, all you really need is what you have learned here in the Chinese Language Centre.